Goals change games, as the saying goes. 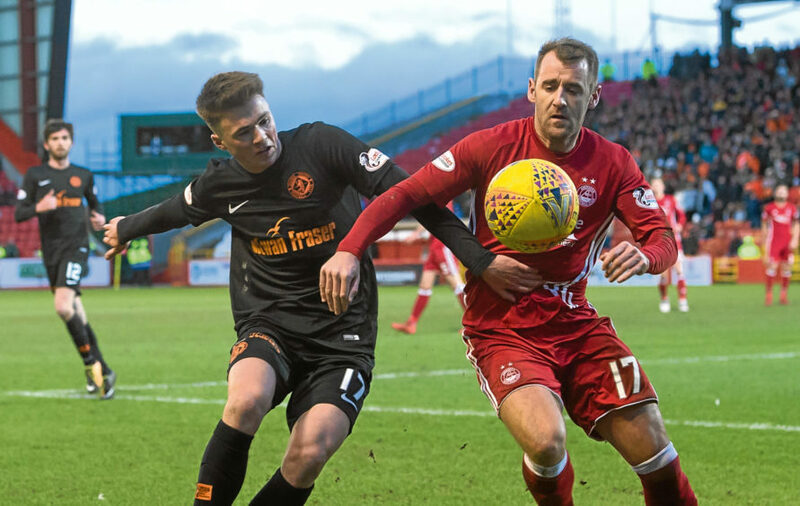 It also changes teams as Dundee United’s composure went out the window as a ruthless Aberdeen booked their place in the quarter-final of the William Hill Scottish Cup at Pittodrie yesterday. 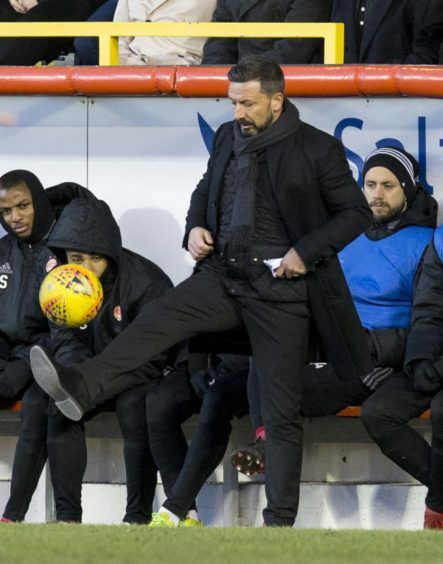 For 20 minutes the Championship side looked reasonably solid and competitive against Derek McInnes’ men but from the moment the Dons broke the deadlock the outcome of this cup-tie was assured. 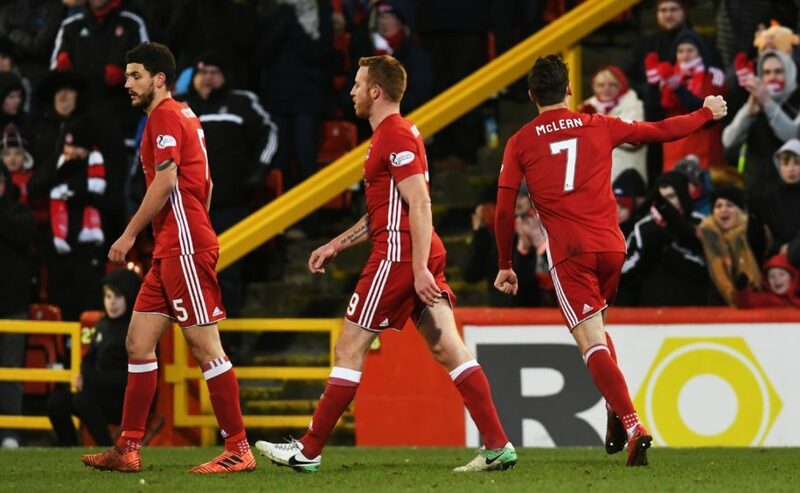 Aberdeen were favourites going into this game and while no one would argue the Dons had moments of quality it is hard to overlook the charitable and calamitous defending of United. In the end the final scoreline flattered United and their late flurry came after the home side had long eased off and settled for its win and with it, passage to the last eight. 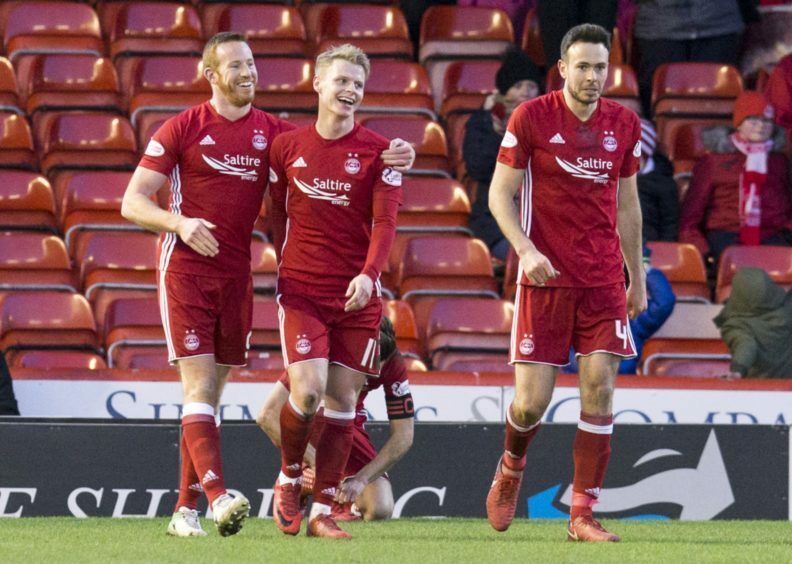 A subdued start from the Dons allowed United to settle into the game and a Scott McKenna header went wide and a Gary Mackay-Steven drive which was saved by visiting goalkeeper Harry Lewis were the only causes of alarm until United abandoned all sense of defensive resolve in 15 madcap minutes. 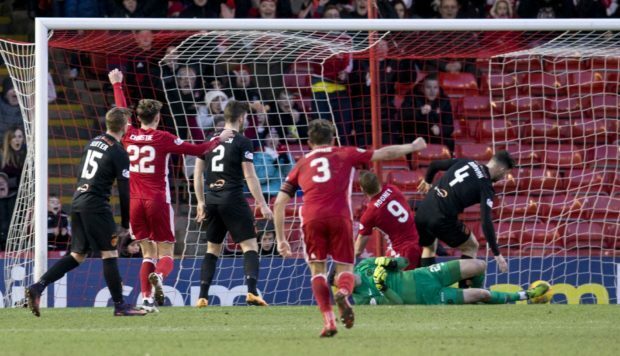 First, Kenny McLean’s driving run down the right and cross fell perfectly at the back post for Mackay-Steven and his looping shot looked to be going in before Adam Rooney made sure by heading the ball into the net from all of a yard. The Tangerines, who had looked resolute until the loss of the goal, then lost their way. Craig Slater was caught in possession and the ball broke to Niall McGinn who skipped past Mark Durnan to give Aberdeen a two-on-one break and the Northern Ireland international released Mackay-Steven who took a touch before slotting past Lewis. 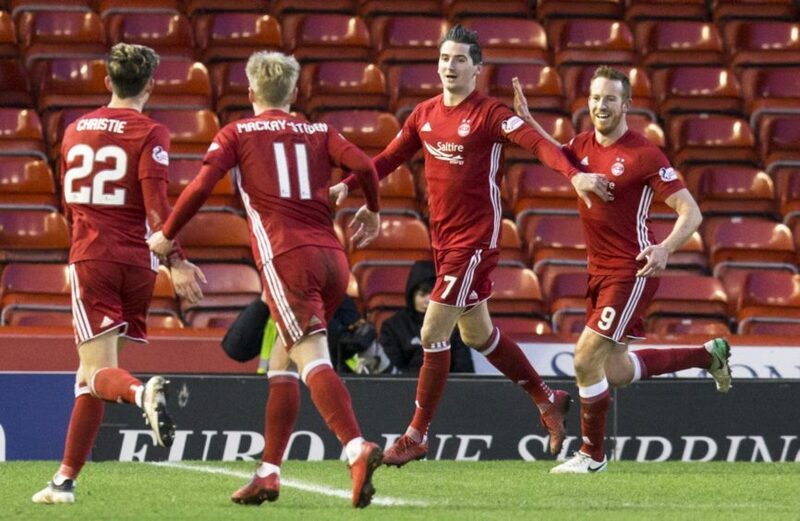 Aberdeen were in equally charitable mood, however, as a poor Anthony O’Connor clearance was capitalised on by United with Emil Lyng releasing Sam Stanton and the midfielder raced clear on goal before beating Freddie Woodman in composed fashion. But United’s lifeline lasted less than a minute as from the restart a sublime Ryan Christie turn took him away from his marker and he picked out McLean with his cross and the midfielder rose above two United defenders to beat Lewis with a looping header from 12 yards. The four goals in the quarter of an hour epitomised the difference between the teams. When United lost the ball Aberdeen were ruthless. When the Dons were sloppy they learned quickly and did not repeat the error of their ways. Sensing the chance to end this tie before the interval the Dons surged forward and Lewis made a superb fingertip save to turn a Mackay-Steven drive over the crossbar but United made it to the break with a lingering hope of getting back into the game. 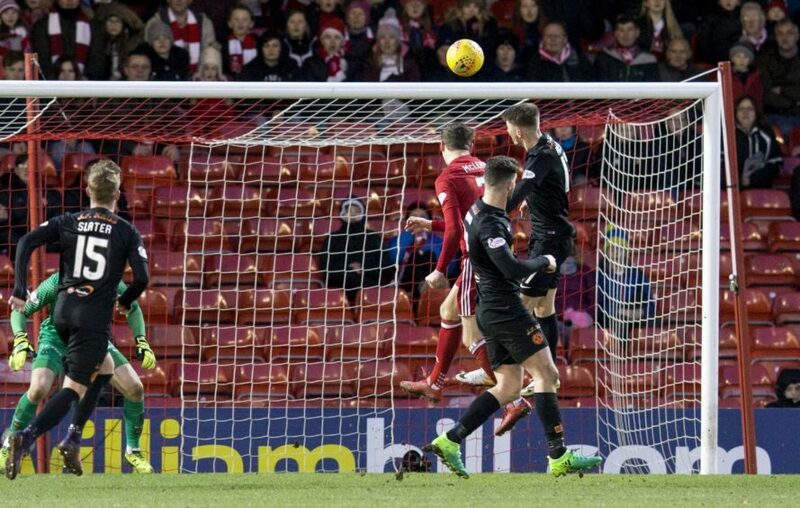 Those hopes, however, were extinguished as the Dons made it 4-1 10 minutes into the second half. Christie was afforded space on the edge of the Tangerines penalty area and he took full advantage, releasing Mackay-Steven on his right who raced into the box and fired past Lewis. United were on the ropes but they dug deep to pull one goal back 20 minutes from time through substitute Paul McMullan, who beat Woodman with a fine curling effort. 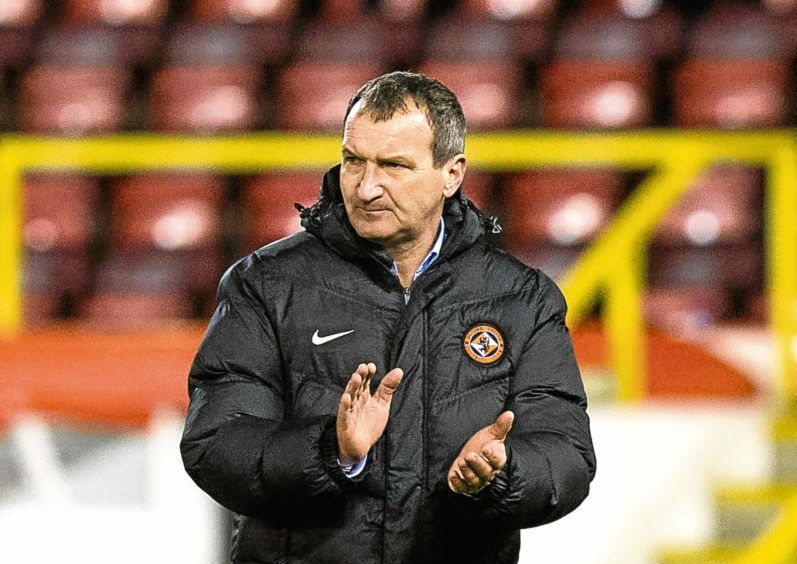 The goal prompted United boss Csaba Laszlo to send on strikers Scott McDonald and Thomas Mikkelsen in the hope of getting a third goal but the Dons should have added a fifth six minutes from time when substitute Dominic Ball found Christie but the midfielder fired high over the crossbar from six yards.